Two rounds of violet-blue blooms with white plicata markings add flash and fire to borders and cutting gardens. 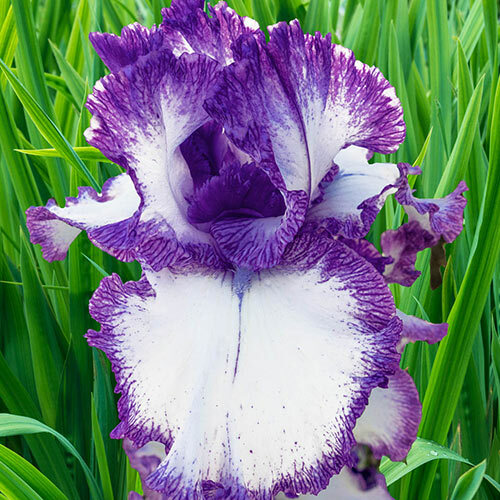 Award-winning variety exhibits exceptional vigor and strong rebloom. Bloom Time Mid to late spring and again in late summer to fall. Set rhizome so bottom 1/2 is below ground-level, firm well and water thoroughly. Well drained. Quite tolerant of a wide range of soils. Remove spent flower stems after flowering. In late fall, cut back foliage to 15 cm fans. Clean plant debris before winter to prevent borers overwintering. None, except to mulch in colder climates for first winter. Remove early in the spring before growth starts.